The Vintner Series individual bottle wine rack kit with display row option is sold to be compatible with the Vintner Archway & Table Top option, or the Vintner Glass Rack and Table Top Option. This wine racking module consists of all the above and below individual wine bottle racking for the unit as pictured. The 8 Ft Option is compatible with stacking double 4 Ft Options. Archway & Table Top, & Glass Rack and Table Top kits sold separately. Assembly required. Napa Vintner Stackable Wine Rack is a modular system crafted from premium redwood that gives a custom appearance at a mass produced price. These wine racks may be stacked on top of one another to reach a height starting at 95 1/16", and with multiple molding packages may go as high as 104 5/16", as well as multiple heights in between. The Vintner Series offers a wide variety of racking options, along with the ability to mix and match racking heights and styles. This wine rack collection was designed to accommodate wine bottles that are 3 - 3 1/2" in diameter. In addition to unstained redwood, the Vintner Series is also available in different stain options: classic mahogany, dark walnut, and midnight black. Made in the USA. This individual bottle wine rack kit with display row option is sold in combination with the Napa Vintner Archway & Table Top option, or the Napa Vintner Glass Rack and Table Top Option. 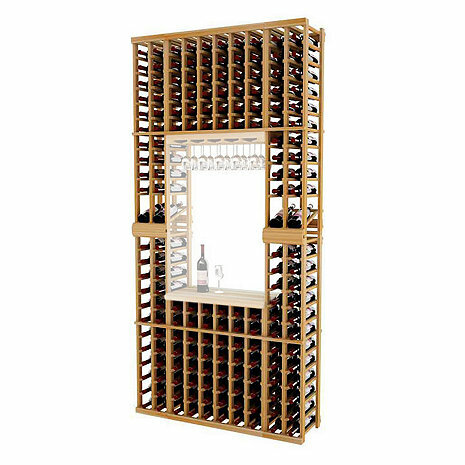 This wine racking module consists of all the above and below individual wine bottle racking for the module as pictured. This wine rack has a display row built in to the center of the design so that wine labels can be visible. Archway & Table Top, & Glass Rack and Table Top kits sold separately. Moldings and platforms sold separately. how many bottles will this hold? Is there storage behind the picture? BEST ANSWER: 176 bottles Total. Can the height of this item be customized? Our cellar ceiling is only 7 feet high. We like the setup of this unit but are hoping you can modify it so it is below 7 feet. If you can, how many rows will be lost from the top? Thank you. Yes, we can follow this set up utilizing custom racking. We can possible get it close as well utilizing kit racking. Please feel free to speak to one of our Wine Cellar Design Specialists @ 1-800-356-8466 to get the process started. converted pantry into wine closet. have 43.5 inch width & depth. can this product be modified to fit? BEST ANSWER: Please call us at 800-377-3330 and a storage consultant can assist you with options. Requires SIGNIFICANTLY more work to put together than advertised. Additionally, you just like puzzles because it comes with virtually no instructions. That being said, it looks pretty good after spending the hours it took to assemble.